On Top Roofing specializes in fabricating and installing standing seam copper and steel roofs. Our metal roofs use standing seam connections and are designed to have no exposed fasteners; keeping your roof watertight. Whether you are replacing a roof or building a new home, we offer a full range of roof profiles, finishes, and architectural details. We provide the highest quality metal roofs in Utah. Put the finishing touches on your home with custom gutters, chimney caps, and flashing details. All our of sheet metal projects are fabricated in-house at our facility in Summit Park. This makes it possible to provide customers with the freedom of choosing the perfect look for their home. Our Sheet Metal artisans will make your home look amazing. Asphalt shingles are among the most popular type of roofing products used in residential roofing. Asphalt shingles are a reliable roofing material that can provide a quality roof. Not only are they tough, but they come in a wide variety of colors and styles to provide you with aesthetics that you're happy with. Contemporary architecture and design are more popular than ever. If you are designing or live in a contemporary home, you likely have a flat roof section. Properly protecting these areas is crucial. Flat roofs look great on your home, but if not roofed properly can cause serious headaches. Our flat roofing team is unmatched. They have perfected how to weld flat roofs to be watertight. Make your home a masterpiece with custom sheet metal. Our team of master tinsmiths craft one of a kind works that will make your home stand out above the rest. Our tinsmiths have over 40 years of combined experience and have completed work for some of the most high-end developers and clubhouses in Park City and the surrounding area. Rooftop snow removal is a great way to extend the life of your roof and prevent ice dams. 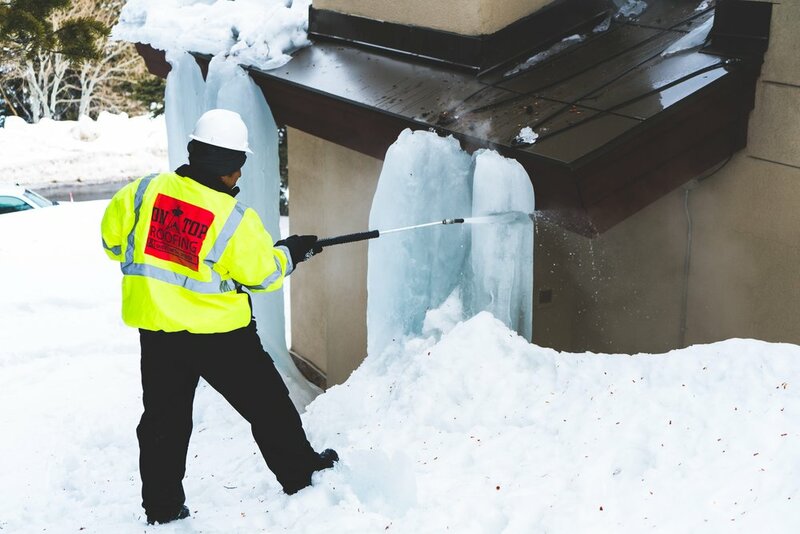 Our roofers are trained to remove snow and ice dams without damaging your roof.